So! I’ve been eyeing the Enchanted Mesa sweater for a long time but always thought it’s wayyyy beyond my skill level mainly because it’s knitted in the round. I usually stay away from projects that are knitted in the round. But then Mike pointed out how he doesn’t understand why I say I can’t knit in the round when I can knit almost everything else. It was a question I couldn’t answer. So I thought I must give it a try! 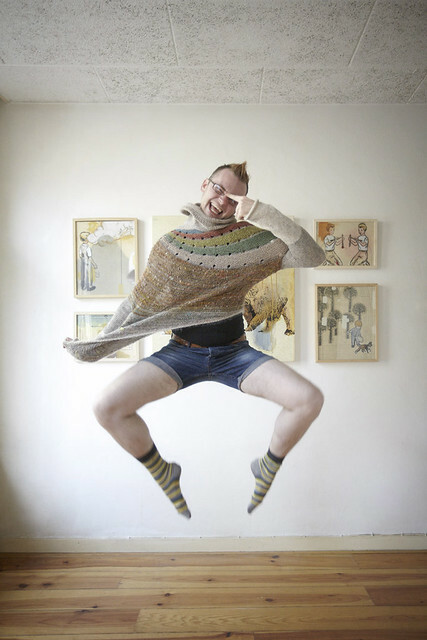 I really like the asymmetrical‐ness of the sweater, and that it’s meant to be knitted with odd balls of stash yarn. I have many many many odd balls of stash yarn. And I really like the patchwork look. 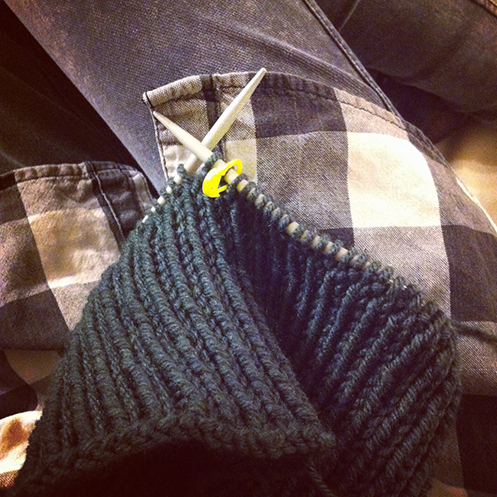 But then the next part of the pattern is knitting short rows back and forth (thank goodness! 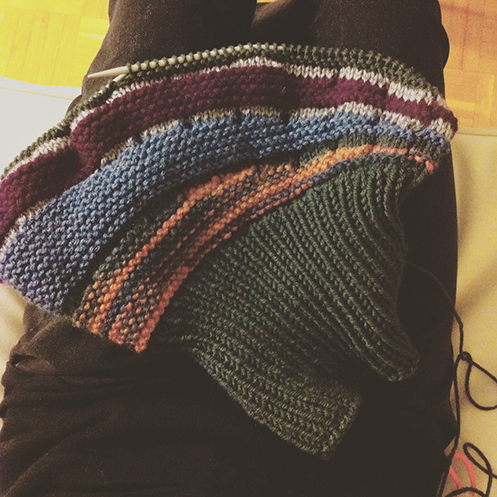 ), and I couldn’t wrap my head around how I could go from magic loop to knitting back and forth. 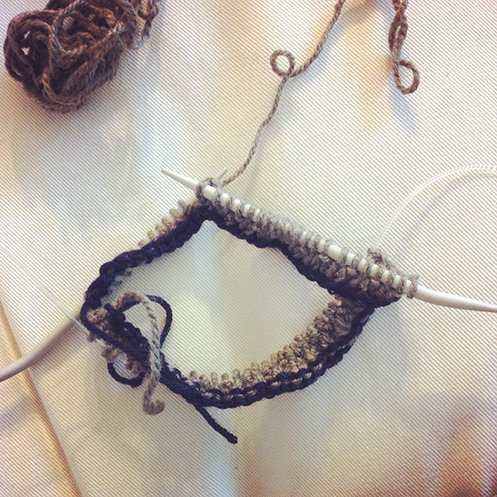 So I decided that I was going to get a shorter circular needle (16″) so I don’t have to do the magic loop. A bit sad that I won’t be using my new skills in this project but at lease I know I can do it! I should also point out that when I bought the Enchanted Mesa pattern on Ravelry it comes with the Outer Space pattern also, which is a chunky version of Enchanted Mesa. So I’m combining the two patterns a bit, using 1x1 rib for the collar, because I’m using a stiff acrylic (what a lot of my stash yarn consists of, and I wasn’t going to use a nice wool for something I don’t have a lot of confidence making in case I mess up :P) and it just won’t drape nicely if I try to make a cowl collar. I also decided to forgo the provisional cast‐on to make everything easier for myself. I made the ribbed collar extra tall so it can be folded down or left up, for an avant garde look, I guess. 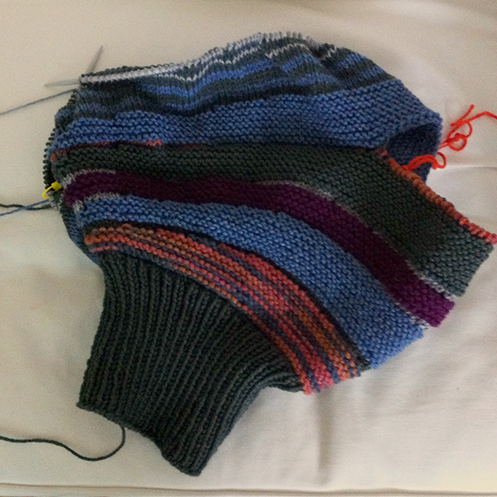 I also had to modified the number of cast‐on stitches and rows in each section because of the heavier yarn I’m using and I wanted a more fitted sweater than what is shown. The many project pages on Ravelry helped a lot. Slowly taking shape! So excited about the asymmetrical sections! Will keep you posted on this knitting adventure! Ce modéle est très original et malgré les difficultés rencontrées, le début de votre ouvrage est très prometteur! Ici en France, il est pratiquement impossible de trouver des aiguilles circulaires ayant un câble court.J’ai essayé le magic loop mais avec des aiguilles de gros diamètre le câble se plie difficilement. J’utilise donc des aiguilles double pointes mais celles‐ci n’existent pas pour les gros diamètres donc pour la grosse laine.Il serait temps que les fabricants d’aiguilles se penchent sur la question ne trouvez vous pas?Bon tricot, j’attends impatiemment de voir votre pull terminé. that is too bad! I haven’t tried to look for large circular needles but I think they at least go up to 7mm in the stores where I shop for yarn, but it seems the larger the needles are the longer the cables. the shortest I’ve seen are 9″ circular needles that are around 3mm — probably for socks? buying needles online might be an option. and it’s true I haven’t seen large double pointed needles neither!